GE Industrial Type THQB 1-Pole Ground fault circuit interrupter is rated at 20-Amps and 120-Volt AC. Interrupt rating of this circuit interrupter is 10-Kilo-Amps. It measures 1-Inch x 2-3/8-Inch x 3-9/32-Inch. 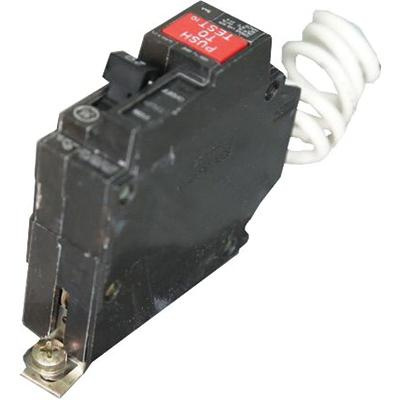 This 1-Phase circuit interrupter with load side lug terminal connection, accommodates copper wire of size 14 - 8-AWG and aluminum wire of size 12 - 8-AWG. This Q-Line frame circuit interrupter features LIG non-interchangeable and fixed thermal-magnetic trip function to ensure reliability. Circuit interrupter with 5-Milli-Amp trip sensitivity, support bolt-on mounting. It is ideal for AL series panelboards, Q-Line loadcenters, residential and commercial applications. Circuit interrupter is UL listed, CSA certified and GSA compliant.